I made these last week for my club ladies, in part to make up for one of the projects we missed in December. Sorry the picture is a little weird around the edges. I used the Candy Lane paper that comes with the Love You Much Bundle. The bundle is only available through the 31st so order yours TODAY!! I attached the DSP to a chipboard coaster with a glue stick and sanded the edges to the shape of the coaster. The heart is a Sticky Cut (from the Sticky Cuts Letters set page 180). They are super sticky, and can be a little tricky to get placed. But, the result is fabulous once you've stuck on the glitter-in this case the Chunky Sprinkles Light Pink (also page 180). The medallion is made by taking Riding Hood Red Designer Label punch, adding a Very Vanilla 1" circle, and topping it with a 'one of a kind', stamped in Riding Rood Red on Pink Pirouette and cut with scissors. 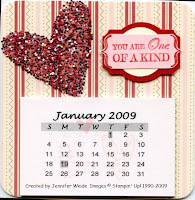 Attach a magnet strip to the top and bottom on the back and you have a great calendar for the fridge or filing cabinet!